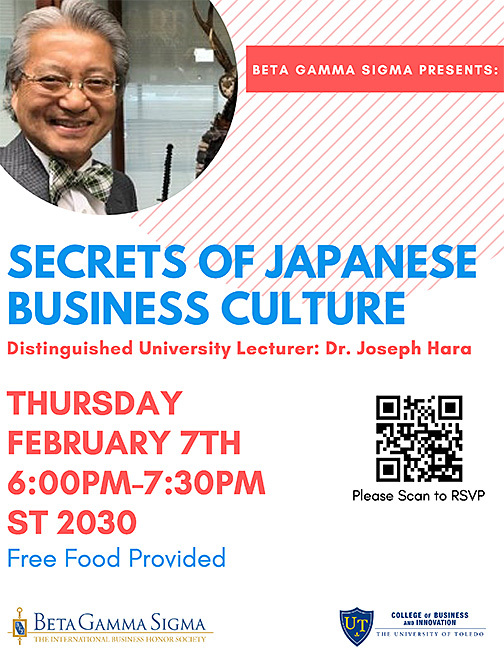 The Beta Gamma Sigma Chapter in the UT College of Business and Innovation will present “Secrets of Japanese Business Culture” Thursday, Feb. 7. Dr. Joseph Hara, Distinguished Lecturer in the UT Department of Foreign Languages, will speak at 6 p.m. in Stranahan Hall Room 2030. He explained that this vacuum of understanding may cause stereotypes, as well as unsuccessful negotiation with Japanese business counterparts. “My objective is to enlighten views on Japanese business practices,” Hara said. For more information on the free event, contact Jamal Shaheen, president of Beta Gamma Sigma, at jamal.shaheen@rockets.utoledo.edu. This entry was posted on Tuesday, February 5th, 2019 at 3:05 am and is filed under Arts and Letters, Business and Innovation, Events, UToday .